Those with their Moon in Cancer have some fairly notable characteristics, although the first thing that comes to my mind is; "Now here is a person who can actually feel another person's pain." The Cancer motto is "I feel, therefore I AM," which gives you a heightened sensitivity to all things wherein you can actually "feel" it in your heart, mind and body. 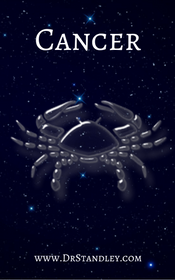 The Moon in Cancer indicates a desire to work or move along the lines of least resistance. There is a strong connection to water and you may find yourself living near water or being attracted to places where water is abundant. You are friendly, sociable and will be attracted to more domestic matters of home and country. There is a strong attraction to the home and family since Cancer naturally rules the 4th house of home and family. This placement indicates feelings and emotions are active, yet can sometimes reflect in an overly-emotional and overly-sensitive nature (especially where your home and family are concerned). You are greatly influenced by your surroundings, thereby "feeling" things through an almost psychic nature either consciously or unconsciously. Because you are so easily influenced by your surroundings, you are also somewhat changeable. Your mind can be changed. You are kind, agreeable, highly sympathetic and humane. You do not like to see anyone hurt or to witness heartache, because when "they" hurt, "you" hurt. There may be times when you are imposed upon, although you do not hold resentments for this imposition. You may find that many times in your Life you have been placed in a position of honor or esteem. Since the Moon represents the mother and nurturing, you may feel an emotional bond to your mother and will have strong nurturing instincts. This instinct may show up in your ability to cook, garden or play mother in some other nurturing way. This influence is that of a "caretaker" or "nurse." Those with their Moon in Cancer are Good, conscientious people. Emotions are tied to that of history; being family and country history. Therefore, you may be highly patriotic toward your homeland. You may also collect memorabilia, scrapbooks, pictures, heirlooms, etc. Your attraction to water may show up in your living arrangements, travel, career, voyages, dealing with liquids or shipping over water. 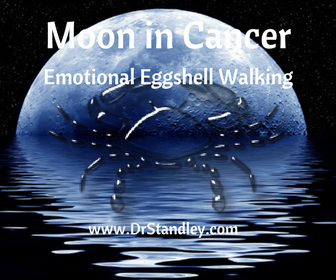 There is an ability or skill toward acting because of the highly emotional and sensitive nature of Cancer. Cancer's can cry on command or by merely hearing an emotional story or watching children wait for a school bus alone in the rain. Your gut instinct, intuition and psychic nature comes from your ability to actually "feel" what is right or wrong, good or bad. Please keep in mind if you can feel anything bad around you, then you should also be able to feel anything good around you. Use this ability to "feel" good in order to attract what you desire in your Life. If the Moon in Cancer is afflicted, there will be a tendency toward emotional instability and probability of smothering their children with Love; so much so that they will tend to dominate their children's lives and homes.